Most Bai villages are situated along the Yunnan-Guizhou Plateau and are crisscrossed by the Lancang, Nujiang, and Jinsha rivers. These river valleys, lush forests, and vast plains are not only beautiful but incredibly fertile, providing the Bai people with an abundance of crops and fruits. The mild climate and rich soil, particularly around the area near Lake Erhai, means they yield crops twice a year, making life for the Bai like an all-you-can-eat buffet! 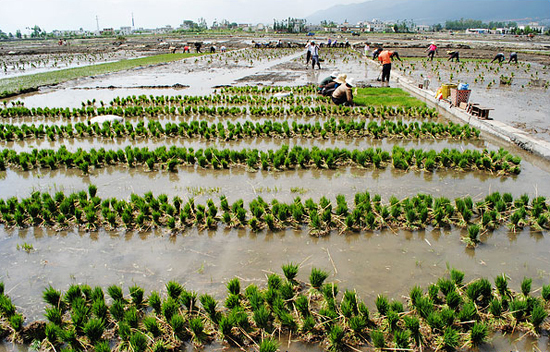 They mainly farm a mixture of staple foods and cash crops such as rice, wheat, beans, cotton, sugarcane, and tobacco. Mount Cangshan, which rises up mistily near the expanse of Lake Erhai, also contains rich deposits of the famous Dali marble, which is treasured both as a building and crafting material. Its pure white exterior, with beautiful red, pale blue, green, and milky yellow veins running through it, is what makes it so unique and peerless compared to other types of marble. The Bai, being astute businesspeople, have long since made the most of these valuable resources! 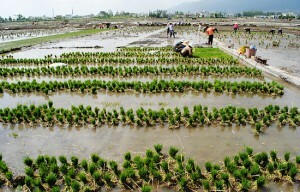 Being an agriculture society, the Bai’s culture still revolves around local markets known as jie. Many Bai villages are self-sufficient, since they grow most of their own food, so these bazaars are designed to provide them with products that they don’t regularly purchase, such as farming equipment or items used for weddings, funerals, and other special occasions. In the Erhai region there is a bazaar every day in a different location so, if you want to see the hustle and bustle of a traditional market, just take a long walk along the lake’s shore! Bai cuisine is characterised by the use of sharp, cold, and spicy flavours, occasionally using a sour tang to complement a dish. From ham and sausage to smoked pig liver and intestines, pork is central to their diet and their love of it is palpable in every Bai dish. Those who live near a lake or river will also have a lot of fish in their diet and they are renowned for their skill at cooking fish in a variety of ways. Bai women are known for their skill at making delicious sauces, such as bean sauce, lobster sauce, and flour sauce. You could almost say their women are a little saucy! Like many people in China, the Bai are great tea lovers and will drink tea twice a day, every day. Morning tea, also known as “awakening tea”, is drunk as soon as they wake up. In the afternoon they will enjoy what is known as “relaxing tea” or “thirst quenching tea”, which some people will add milk or popcorn to depending on preference. They have become famous for a custom known as the Three Courses of Tea ceremony, where three types of tea are served in succession to symbolise the course of life. 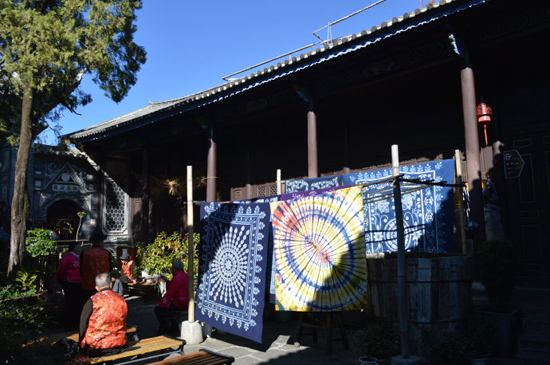 Bai women in Yunnan are incredibly skilled at batik but, unlike many ethnic minorities, they have continued to use the bandhnu method. This method involves tying, twisting, knotting, pinching, or even stitching the material into the desired patterns, which are usually floral. The material is then dipped into a vat full of indigo dye and left for a certain amount of time. The binding process hinders the dye from reaching parts of the fabric and, if the binding is tight enough, may prevent it entirely. Once the material has been allowed to dry, it is released and, while the unbound parts of the material have been dyed a deep blue, the bound parts reveal a pattern as they have remained their original white. This tying and dying process can be repeated several times to create more complex designs. The patterns achieved are more natural than the other styles of batik but less exact, and the natural dye is gentler on the skin and less likely to fade. They are also accomplished at lacquer work and have been renowned for their lacquer wares since the Yuan (1271-1368) and Ming (1368-1644) dynasties.